Every year I teach 1st and 2nd graders how the Everybody section is organized and every year my 3rd, 4th and 5th graders act like they have never heard that the Everybody (and Fiction) sections are organized in alphabetical order by the first three letters of the author's last name. I have two different activities for 1st and 2nd grade and in both lessons, they can find an Everybody call number that I give them. In first grade, we read the book Elsworth's Electrical Ears, a cute alphabetical book of alliterations. While we are reading I ask if they notice anything about the book and someone always comes up with that it is in ABC order. 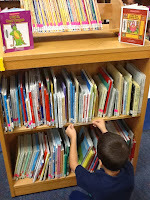 After the book, I ask them if they notice anything about the Everybody section and someone always notices that the wooden letters I have attached to the shelves are in ABC order. Then I talk about how the library is like a little city and we have different neighborhoods and if a friend asked you to come over and play, what would your mom need to know to get you to the house? They say the address. Then I explain to them that each book in the library has an address or call number that tells us where the book "lives" in the library. When an author write a picture book, then it lives in the Everybody "neighborhood" on the "street" of the first letter of the last name. I tell them that if I wrote a book, my book would live on "R" street at the address "ROM" and I go stand at the Rs. I ask them to think about their last name and to go sit in front of the shelf where their book would live if they wrote one. Then I say the whole alphabet and tell them to stand up when I say their letter so they can see all the way around the shelves A-Z. Then I give each partner group an index card with an address on it like E PAT, E MUN, etc. and tell them to find that address and raise their hand when they do. I give them about 3-4 different cards depending on the time. And low and behold, they are mostly successful. In second grade I start with the story Alpha-Betti. 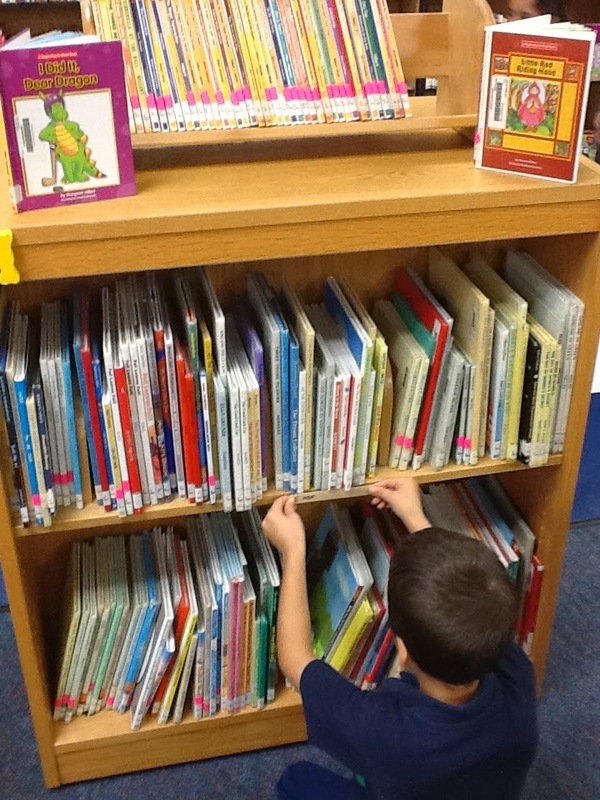 A story about a girl who finds out that it is easier to find things when they are organized in alphabetical order. I remind them about the lesson we did in first grade and how the Everybody neighborhood is organized by the author's last name. We then go to the tables and play a game called "Sticks and Stones" that I got from the book Stretch Library Lessons. 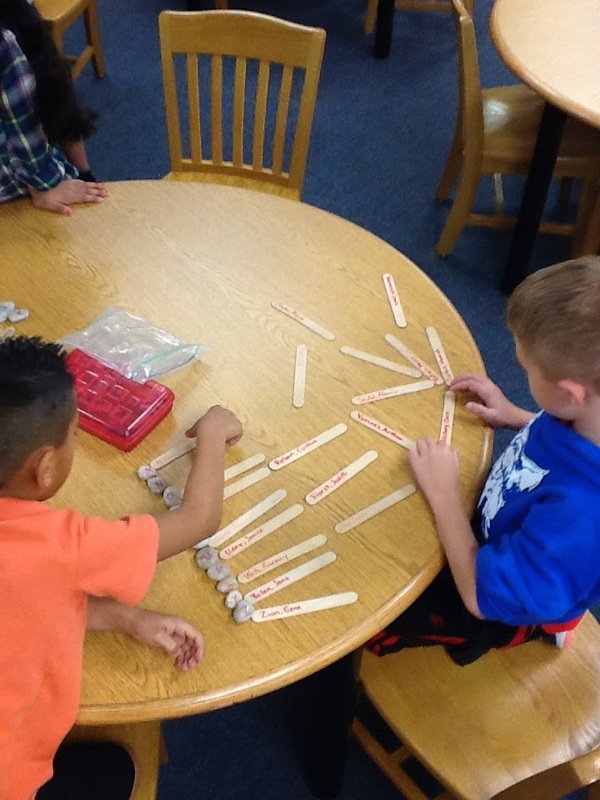 In this activity, they have stones with letters on them and sticks with author's names. They have to arrange the stones in order first and then the sticks and if their are two names that have the same letters, they have to look at the second and third etc. 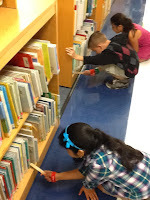 When they are all finished, I give each person a stick that has a call number on it, similar to the index cards from 1st grade, except this time they are working alone and I tell them we are going to see how many they can find in a certain amount of time. When they find the first one, they raise their hand and the teacher and I go around, check that they found the right spot and give them a new stick. They think it is SO fun to find books this way and love to see how many they can find in the given amount of time. Afterwards, we gather back together and I tell them that they are becoming better library users and can now start finding books on their own. If they ask me where a "No David" book is and I tell them SHA, they should be able to go there and find the books. Then I make them raise their right hand and repeat after me..."I am a library user. I know the Everybody books are organized in alphabetical order by the author's last name. I can find books in the Everybody section by myself. I will NOT forget how to do this when I am in third grade"(that's when they giggle). 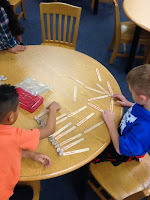 I tell them that something must happen to the brains of 2nd graders over the summer because every year I teach this same lesson and every year the second graders know how to do it and every year, the third graders look at me like I am crazy when I tell them to find something. They assure me that this will not happen to them and they WILL remember. They are so excited about this and for the rest of 2nd grade, they quiz me about where different favorite books are and I love to see how proud they are when they find them. Then they become 3rd graders... and look at me like I am crazy... but this year I have proof... I have pictures!